The IT/Digital Legal Companion is a comprehensive business and legal guidance covering intellectual property for digital business; digital contract fundamentals; open source rules and strategies; development, consulting and outsourcing; software as a service; business software licensing, partnering, and distribution; web and Internet agreements; privacy on the Internet; digital multimedia content clearance and distribution; IT standards; video game development and content deals; international distribution; and user-created content, mash-ups, MMOGs, and web widgets. This book is intended for executives, entrepreneurs, finance and business development officers; technology and engineering officers; marketers, licensing professionals, and technology professionals; in-house counsel; and anyone else that deals with software or digital technology in business. This book is for executives, entrepreneurs, finance and business development officers, technology and engineering officers, marketers, licensing professionals, technology professionals, in-house counsel, and anyone else that deals with software or digital technology in business. Gene K. Landy is a shareholder of Ruberto, Israel & Weiner, P.C., Boston, MA, where he is the head of the firm's Technology Group. His practice covers domestic and international transactions for high technology businesses, from start-ups to publicly traded companies. His work includes licensing, intellectual property, technology transfer, business sales and acquisitions and investments. He is a graduate of Massachusetts Institute of Technology (MIT) and Harvard Law School. Editing and additional content supplied by Amy J. Mastrobattista, a graduate of Smith College and New York University Law School. Amy is a shareholder at Ruberto, Israel & Weiner, PC and a member of the Technology Group. She is active in technology licensing, finance and corporate transactions. She was recognized as one of Boston’s Top 10 Lawyers by the Women’s Business Boston readers’ poll. "As an entrepreneur, founder and CEO of several tech companies, I appreciate the insight into IP, strategy and deals that this book provides. I wish there were a book like this when I started by my first company. The book is easy-to-read, comprehensive and up-to-the moment. It covers everything from basic IP and deal negotiations to mobile media, software IP and the Internet. There is lots of detail, sample forms, and practical tips. This book is the first comprehensive and intelligent resource for creating real value through IP. More entrepreneurs and engineers need to pay attention to what the real world of IP is about." --Beth A. Marcus, Ph.D., CEO and Director, Zeemote, Inc. (www.zeemote.com). "The title says that the book is a legal companion, and that is precisely what it is. Gene has put together years of a lawyer’s wisdom into this companion, but without burdening it with any legal language at all. Keep this companion next to you if you are a practicing manager involved with IT or digital content transactions."--Dr. G. Venkatesh, Chief Technology and Strategy Officer and Executive Director of Sasken Communication Technologies Ltd., Bangalore, India (www.sasken.com). "Gene Landy's book allows insight into the critical decisions that individuals and companies need to make in deciding how to build and protect digital and online products, services, and businesses." --Charles Nesson, Professor, Harvard Law School and Founder and Co-Director of the Berkman Center for Internet & Society (www.cyber.law.harvard.edu). "The IT/Digital Legal Companion is like a Department Store where you easily find the part of the store where you want to go shopping but may also stop in other areas to browse. With this book, the organization makes it easy to find the area of greatest interest relating to a particular business issue. The book covers a wide range of topics from contract and intellectual property law to more specialized issues including Software as a Service, Open Source and digital content. The book covers legal issues facing both technology suppliers (e.g. software vendors) and consumers (e.g. companies contracting for services). Service providers working with these organizations will also find the book useful." --Jim Geisman, President, MarketShare, Inc. (www.marketshare.com), software marketing consultant and advisor and mentor to technology companies. 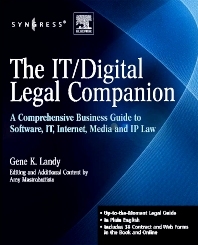 "I found Gene Landy's latest publication The IT/Digital Legal Companion to be a clear and comprehensive book from an attorney who specializes in helping technology companies build and preserve the value of their companies and intellectual property. I appreciate how this publication clarifies IT agreements and complex IP arrangements. I was also amazed at the breadth and level of detail in this book." --Peter Duflo, President and CEO, Strategic Ventures, LLC (www.strategicventures.com), consulting for mergers, acquisitions and executive search for information technology companies.